Which process or service do you require? Can you specify the type? Desired State/Province of Job Shop? Desired City of Job Shop? Select Value 1" to 6" 12" to 24" 24" to 48" 48" or larger 6" to 12" Up to 1"
ThomasNet Custom Quotes provides its Request for Quote service solely to enable our users with legitimate requests for product and service information to contact the companies in the ThomasNet Custom Quotes database (“Suppliers”). The use of this service is subject to our Terms & Conditions. You alone are responsible for the contents of your Request for Quote sent through this website. You agree that you will not use our Request for Quote service for chain letters, junk mail, "spamming" or advertisements of any kind or to send any message or material that is unlawful, offensive, or violates the rights of others. If we become aware of or determine, in our sole discretion, that you are violating any of the above or our Terms & Conditions, we may block your IP address from future use on this website with or without notice to you. As outlined in our Privacy Statement, ThomasNet Custom Quotes is committed to protecting your privacy. By submitting a Request for Quote, you authorize us to share your contact information [and all project details and attachments] with up to 5 Suppliers who match the requested criteria set forth in your Request for Quote. Technology: Blow Molding Services are manufacturing services that form plastics and glass into hollow products such as containers and bottles. Three main techniques used in blow molding are extrusion blow molding, injection blow molding, and stretch blow molding. Although common for making plastic bottles, blow molding is also used to make many hollow flat parts as well, such as tool set kits, in addition to a host of products ranging from medical wares to recreational goods. Blow molding produces parts that can accept variations in wall thickness because air pressure is used to expand softened plastic forms, called parisons, against the inside surfaces of hollow molds. 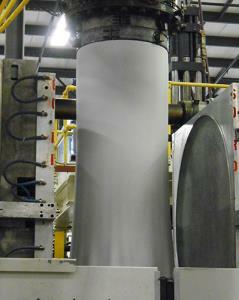 Blow molding can create large items. In most blow molding operations, plastic material is extruded into a molten cylindrical tube which drops vertically between two mold halves. After the mold closes, a nozzle injects pressurized air into molten cylinder, expanding it out to the surfaces of the mold. Other blow molding operations are two stage where performs are made on injection molding machines, often with neck features such as cap threads formed there as well. These preforms are then heated again during the blow molding process and formed. Advantages: Blow molding services offer an alternative to injection molding and rotational molding services.